GRAHAME-WHlTE GANYMEDE. The F.IV Ganymede was designed as a long-range day bomber just before the Armistice in 1918 and was not produced in quantity. It was a twin-fuselage biplane with two 270-h.p. Sunbeam Maori engines driving tractor airscrews, and a third Maori at the rear of the central nacelle driving a pusher propeller. Originally 400-h.p. Liberty engines were to have been fitted. The wing span was 89 ft. 3 in. and the length 49 ft. 9 in. With the Maoris the maximum speed at sea-level was 105 m.p.h. and the endurance 9 hours. The loaded weight was 16,000 lb. By the nose of the Ganymede is the 20-ft.-span Grahame-White Bantam sporting biplane (80-h.p. Le Rhone). 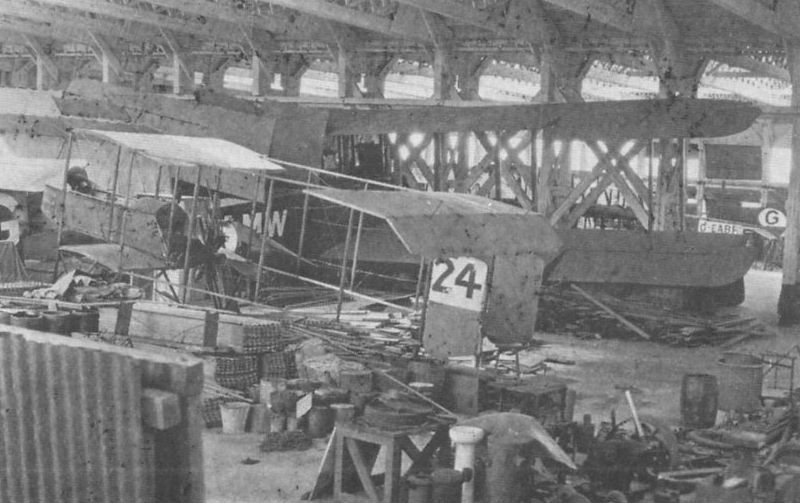 One of the Grahame-White hangars which the author used as a workshop. The large aircraft in the background is the G.W.E.9 Ganymede G-EAMW.